Join us at 7pm on Thursday, November 9th at Book Culture on 112th St. as Lauren-Brooke Eisen discusses Inside Private Prisons: An American Dilemma in the Age of Mass Incarceration. She will be joined in conversation by Vincent Schiraldi. When the tough-on-crime politics of the 1980s overcrowded state prisons, private companies saw potential profit in building and operating correctional facilities. Today more than a hundred thousand of the 1.5 million incarcerated Americans are held in private prisons in twenty-nine states and federal corrections. Private prisons are criticized for making money off mass incarceration--to the tune of $5 billion in annual revenue. 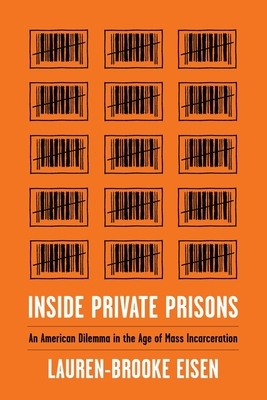 Based on Lauren-Brooke Eisen's work as a prosecutor, journalist, and attorney at policy think tanks, Inside Private Prisons blends investigative reportage and quantitative and historical research to analyze privatized corrections in America. From divestment campaigns to boardrooms to private immigration-detention centers across the Southwest, Eisen examines private prisons through the eyes of inmates, their families, correctional staff, policymakers, activists, Immigration and Customs Enforcement employees, undocumented immigrants, and the executives of America's largest private prison corporations. Private prisons have become ground zero in the anti-mass-incarceration movement. Universities have divested from these companies, political candidates hesitate to accept their campaign donations, and the Department of Justice tried to phase out its contracts with them. On the other side, impoverished rural towns often try to lure the for-profit prison industry to build facilities and create new jobs. Neither an endorsement or a demonization, Inside Private Prisons details the complicated and perverse incentives rooted in the industry, from mandatory bed occupancy to vested interests in mass incarceration. If private prisons are here to stay, how can we fix them? This book is a blueprint for policymakers to reform practices and for concerned citizens to understand our changing carceral landscape. Lauren-Brooke Eisen is senior counsel in the Brennan Center's Justice Program, where she focuses on changing financial incentives in the criminal-justice system. Previously she was a senior program associate at the Vera Institute of Justice in the Center on Sentencing and Corrections, served as an assistant district attorney in New York City, and taught criminal justice at Yale College and the John Jay College of Criminal Justice. Vincent Schiraldi is a Senior Research Scientist and Adjunct Professor at the Columbia University Justice Lab, which he co-directs. Formerly, Schiraldi directed the Program in Criminal Justice Policy and Management at Harvard Kennedy School, and founded and ran both the Justice Policy Institute think tank and the Center on Juvenile and Criminal Justice. His government work includes directing the Department of Youth Rehabilitation Services in Washington, D.C., serving as commissioner of the New York City Department of Probation, and as senior advisor to the New York City Mayor’s Office of Criminal Justice. He lives in Brooklyn, NY.